A group of investigators dispatched by the prosecution forced their way into Geumsuwon, a compound in Anseong, Gyeonggi Province, in a bid to arrest the de facto owner of the sunken ferry Sewol around at 12:10 p.m., Wednesday. The compound is owned by the Salvation Sect, which is allegedly led by former Semo Group chief Yoo Byung-eon. Yoo is suspected of hiding out in the compound, which is being protected by sect members. 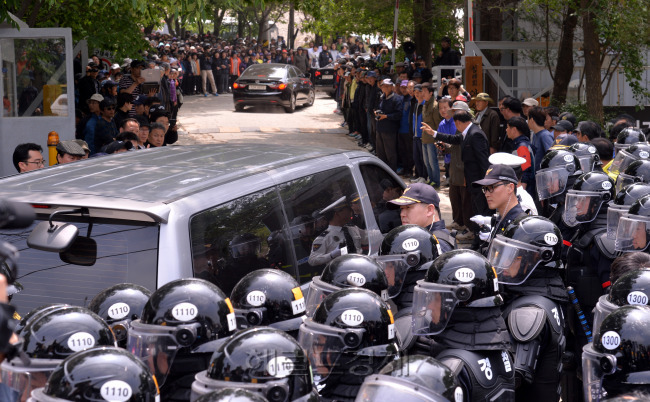 In a break from the strong resistance they had been putting up, hundreds of Yoo’s followers stood aside to let about 70 investigators’ entry into the compound. Earlier in the day, spokespeople for Geumsuwon expressed their willingness to cooperate with prosecutors over the investigation. Investigators are also targeting Yoo’s oldest son Dae-gyun for arrest, as he is suspected of committing a variety of irregularities during his management of some affiliates of Chonghaejin Marine Co., the operator of the ill-fated Sewol. About 1,000 riot policemen are deployed around the compound in preparation for the upcoming raid and possible emergency situation. The prosecution on Tuesday raised the possibility that Yoo had already covertly left Geumsuwon. * Pursuant to an order by the Press Arbitration Commission, we have been asked to publish the following statement from the Evangelical Baptist Church (EBC). After the April 16, 2014 Sewol ferry tragedy, the media published a flood of indiscriminate articles regarding the EBC (also known as Guwonpa* in Korean) and Mr. Yoo Byung-eun. Due to the immense volume of articles, it is impossible to correct and counter every single one. Therefore, in agreement with the EBC and the surviving family of Mr. Yoo Byung-eun, we are publishing the following combined corrections and Official Statement by EBC. The majority of the media reported that, as the owner of the Sewol ferry, Mr. Yoo Byung-eun directly managed Chonghaejin and its affiliated companies and that he used operating funds for personal purposes. However, Mr. Yoo retired from his executive management position in 1997. He did not own any shares in the noted companies, nor had he managed operations, nor used the operating funds for personal reasons. He was not the owner of the Sewol ferry, nor the Chief Executive Officer of Chonghaejin. As such, he had not provided any directives in regards to the overloading of the Sewol ferry or its renovation (e.g. expansion of the cabins and cargo area). Although some media outlets reported that Mr. Yoo Byung-eun had established favorable relationships by paying bribes to politicians, Korean Prosecutors’ Office verified last October that reports of such bribery activity were false. We hereby correct all articles pertaining to this matter. The majority of the media reported that Mr. Yoo Byung-eun was a wealthy billionaire who owned real estate properties, including Geumsuwon, both in Korea and abroad under other people’s names and that he diverted the tithes and offerings made to the EBC to an illicit fund and expanded his businesses. The EBC has confirmed that reports of his wealth incorrectly included real estate properties owned by farming associations, which had been established by church members. Thus, these reported properties were not held by Mr. Yoo Byung-eun in another person’s name, but are owned by the noted farming associations. Additionally, Mr. Yoo did not embezzle from the EBC nor did he expand his businesses by diverting tithes or offerings of the pertaining church and its members into an illicit fund. The EBC has stated that Mr. Yoo Byung-eun was not a religious sect leader. Although he was ordained as a pastor in the 1970s by missionaries at the Far East Broadcasting Company, he did not serve as a pastor. There is no pastor in the EBC, since it is a congregation of laymen. process to register EBC as a church in 1981, nor had he been revered as a religious sect leader or been made into a God-like figure by the pertaining church or its members. The majority of the media reported that the EBC is a religious cult and that it preaches doctrines that are not consistent with Christianity. There are certain churches in Korea that call the EBC a cult, solely based on differences between their and the EBC’s doctrines. However, the EBC has affirmed its belief in the Bible, the Trinity, Jesus’ conception by the Holy Spirit, His birth, death, and resurrection. The EBC does not worship a particular individual as a religious sect leader or preach any doctrine that contradicts the Bible. It was verified that the captain and the crew members who abandoned the ship at the time of the Sewol ferry accident are not members of the EBC. Only two people have been confirmed as members of the EBC: the late Jeong Hyun-seon, who died while evacuating passengers and thus was designated a national hero, and another person, who had been rescuing passengers and was himself later rescued in an unconscious state. It has also been verified that the EBC does not own any shares of Chonghaejin and that it did not engage in its management. Furthermore, the EBC has stated that Lee Yong-wook, a senior Coast Guard official, has not attended the EBC for the past 15 years. The majority of the media reported that Mr. Yoo Byung-eun attempted to flee the country by ship, that he requested asylum in several countries but was rejected, and that he possessed firearms to protect himself. The prosecutors hastily announced without confirming the facts that Mr. Yoo Byung-eun attempted to seek asylum. However, two months later on August 18, the prosecutors revised their statement noting that “upon investigation into the identity of the caller, a person with no relation to the Salvation Group had placed a prank call.” In addition, there was no evidence of any attempt by Mr. Yoo to flee the country. It has also been confirmed that the firearms alleged to be in his possession were collectibles. Furthermore, not only were they collectibles that could not be operated they were also not in his possession while he was fleeing. Some news articles created the impression that the EBC and Mr. Yoo Byung-eun were behind the Odaeyang mass suicide incident. Some also reported that Mr. Yoo Byung-eun had been able to rapidly grow the Semo Group in the 1980s (e.g. securing the business rights to operate the Han River Ferry Cruise) by using a connection with Mr. Chun Kyung-hwan and a close relationship with the former President Chun Doo-hwan’s Fifth Republic of Korea. However, the Odaeyang mass suicide incident was thoroughly investigated by the prosecution and the police three times—in 1987, 1989, and 1991. All three investigations concluded that the EBC and Mr. Yoo Byung-eun had no connection to the incident. Also, neither Mr. Yoo Byung-eun nor the EBC had any collusive ties with the Fifth Republic of Korea. All of this was verified in the official document issued from the Incheon District Prosecutors’ Office on May 21, 2014. The artwork of Ahae (Mr. Yoo Byung-eun) was examined and authorized for exhibitions at renowned museums and exhibition sites in the United States and Europe by their screening committees. The exhibitions were unrelated to donations, and it was confirmed that there was no causal relationship between Ahae’s donation history and the exhibitions. Moreover, Mr. Yoo’s photography exhibitions were authorized by the committees after the directors of the respective museums had acknowledged the artistic value of Ahae’s works and subsequently proposed hosting the exhibitions. It has been confirmed that the exhibitions were not a result of Mr. Yoo’s patronage or donation. Additionally, the above museums have verified that an exhibition can never be authorized unless the artistic value of an artist’s works is recognized by the screening committee, irrespective of the amount of money an artist donates. Additionally, it was reported that Mr. Yoo coerced Chonghaejin and its affiliates to purchase his photos at inflated prices. However, this has been confirmed to be false. “We sincerely request of the press to serve the public’s right to know with objective and balanced reporting, guarding against biased arguments from its interviewees, all the while fulfilling its duty and responsibility to create no victims from such reporting.